brown bears in Finnish winter. In conjunction with Natures Images, join us in winter along one of Europes most desolate and wild areas, along the Finnish and Russian border. Where, within this Taiga forests, lives the Brown Bear. This is a location that is more associated with the summer months but by going earlier in the season, the potential is there to capture this beautiful predator in a winter environment. Photos courtesy of Natures Images. At this time of year the bears have just come out of hibernation and make their way to this special feeding site, amongst the old growth of the Taiga forest. 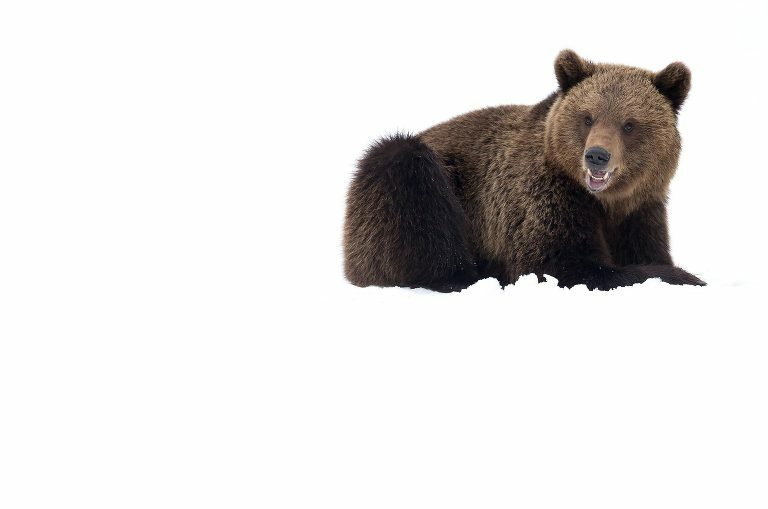 In their thick winter coats, the bears look striking alongside the cold winter environment. With the additional opportunity to photograph Red Squirrel and a number of forest bird species in the snow near our accommodation, this is a great opportunity to experience the boreal forest as it begins to wake from the long winter months. This photography workshop holds a maximum group size of 7. Our guest house is very comfortable for the remote location, set amongst the forest and is based on twin rooms with en-suite bathrooms. Day 1: We travel to Kajaani airport in Finland where we will be met by our Finnish host for the 2-3 hour transfer to our base for the trip, Martinselkosen. We’ll arrive too late for any hide-based photography for the bears this evening so we’ll discuss our activities for the next few days over a very welcome dinner. Day 2: Breakfast is served at 8.00 am, after which we have the morning to photograph the local wildlife in the grounds of our accommodation. This includes species such as red squirrels, bullfinches and redpolls. After dinner at 2.30pm we get ready for the short journey to the bear hides, where we have exclusive use of 5, 2 man hides set in a swamp of a forest clearing. Transfer to the hides will be via snowmobiles with trailers and once there, we will spend the night. At this time of year, we have enough light to photograph until around 8.30pm, after which we can sleep for around 7 or 8 hours (beds are provided in the hides), until the light starts to improve around 5.00am. We then leave the hides at 7.30 am and head back to our accommodation to have breakfast. Day 3-5: After breakfast, you have a choice either to relax in your room or photograph the local wildlife in the grounds. Each day of the trip follows the same pattern of Day 2 and after dinner we will be transferring back to the hides. Days 6: After our final night in the hide we’ll have time to shower and breakfast before returning to Kajaani airport for our flights home. A deposit of of £425 is required at the time of booking.